I know Easter is supposed to be all about Jesus rising back up after dying on the cross and everything, but as a completely non-religious person I can’t help but be excited that the chocolate-themed holiday is coming back. To me, Easter IS chocolate, and that’s that. Oh and Jesus but you know, he’d have wanted us all to celebrate his resurrection with as much chocolate as we could stuff in our mouths – I just know he would. 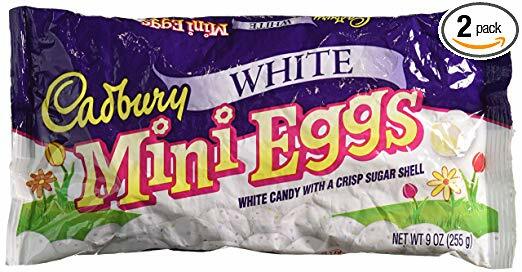 Well, it’s going to be even easier to guzzle down some of your favourite sweet treats this year, as there’s a whole load of variation to help you get into that chocolate-induced food coma, and one of those things is CADBURY WHITE CHOCOLATE MINI EGGS. Yes, their already milk-chocolate predecessor is already good enough, but can you just imagine how delicious the white chocolate version is? I can, and my mouth is already watering. ONLY ISSUE – is that they’re not currently available to buy in UK supermarkets (bummer), but you CAN buy them on Amazon and Ebay, so all is not lost. The packs will cost set you back £11.44 ($14.99) for two 225g packets and £9.97 ($12.99) for one 225g packet respectively. So what are you waiting for? Go and fill up your (Easter) basket with all the white chocolate treats and have a merry old time chomping down on them this Easter – it’s what Jesus would have wanted you to do.